Octopuses are semelparous, which means they generally reproduce only once and then die. Organisms with this strategy use all available resources into maximizing reproduction. After fertilization females meticulously care for their eggs, circulating water to keep the eggs clean and protecting them from predators until they hatch. Depending on the species, this incubation period can last for 1 to 3 months for shallow-water octopuses and the females die after this period. 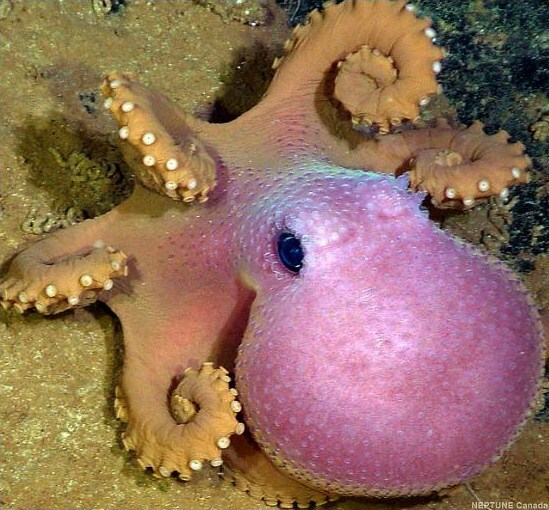 However, little is known about life in the deep sea including deep-living octopus species. 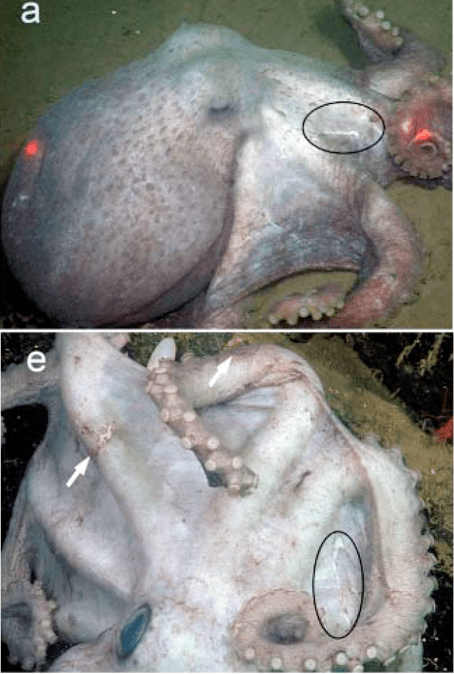 The deep-sea octopus Graneledone boreopacifica (Figure 1) lives in north Pacific between 30 and 3000 meters. Females get their eggs fertilized by multiple males, as confirmed by genetic markers, but because they are so difficult to observe there is limited information about their biology. In April 2007, Robison and collaborators were inspecting exposed bedrock 1397 meters below sea level in the Monterey Submarine Canyon using a remotely operated vehicle (ROV) when they found a female of Graneledone boreopacifica. They returned to the site in May 2007 and were able to identify the same female based on characteristic scars (Figure 2). The female was guarding a clutch of eggs. Robison and collaborators started recording the period of incubation from May 2007 and returned to the same spot 18 times over the egg-brooding period, which lasted for 53 months. By measuring the eggs in the periphery of the clutch, they recorded a continuous growth over time (Figure 3) and were therefore able to confirm they were observing the same clutch of eggs. Figure 2: identification marks of female of Graneledone boreopacifica in a) April, 2007 and e) December, 2010. During this period the authors did not see any evidence that the female was feeding, as it known to occur in shallow-water octopuses. The female was losing skin texture, pigmentation on the arms and had cloudy eyes (as you can see in Figure 2a – e). The mother survived the 53-month brooding period without feeding due to a low metabolic rate caused by inactivity and the low temperature of its environment (recorded from 2.8°C to 3.4°C in the study site). This four-and-a-half year egg-brooding period is the longest ever reported and has produced the largest and most developed hatchlings known to date. 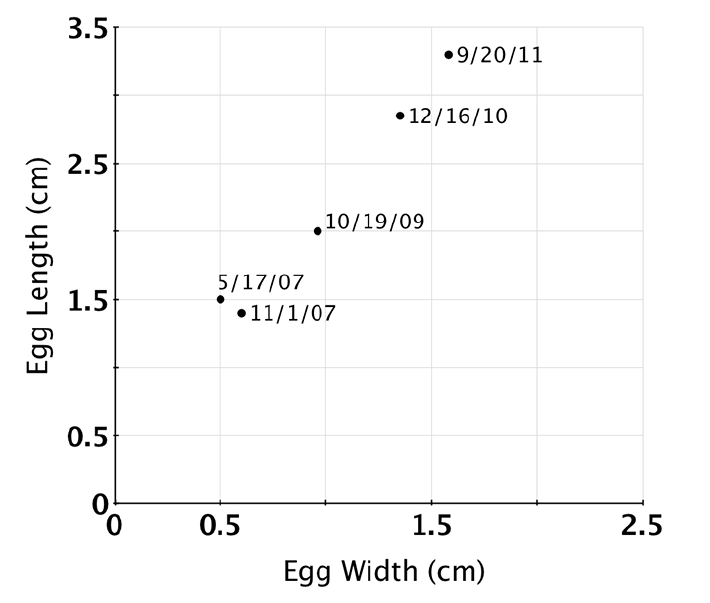 Figure 3: Egg growth over time. The deep sea is the largest habitat on earth but it is less explored than the surface of the moon. It has very important biodiversity hotspots, regulates the weather and climate and is an important source of food and energy. Our understanding of these habitats is still very limited, mainly because they are difficult and expensive to access. But the exploration of the depths is crucial to obtain valuable knowledge for management and conservation of resources from this mysterious part of the world.